ill-intentioned and adds a table with millions of records inside a dashboard. In general tables used in dashboards should have a small number of rows, but in case you really need a table with many rows, you are able from version 7.3 to set a "Rows per page" property. 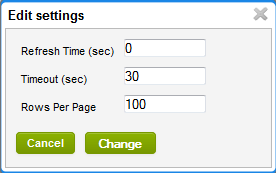 This value can be set between 5 and 100 allowing to have a different pagination if business requires.